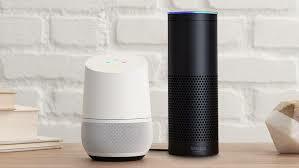 For the last several weeks I’ve been thinking about purchasing an Amazon Alexa or Google Assistant, mainly out of geeky curoisity of what I might be able to do with one of these devices. But in researching what they can and cannot do, it got me to thinking about what real automation means to me. It’s obvious that I’m very interested in automation, and though I have concerns about how disruptive technology affects other aspects of our society, the focus of this article is about why I don’t find, as of now, the assistive devices very useful, as well as what types of automation I find most useful on my Mac. You may have different opinions on this subject, so I invite you to share your thoughts in the comment section at the end of this article. 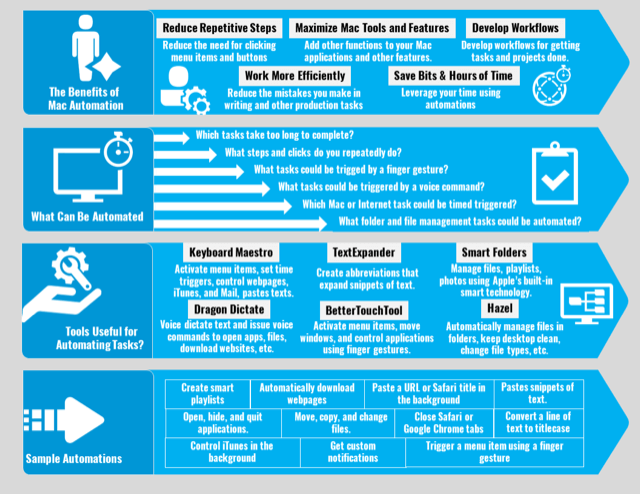 After reading this article, let me and other readers know what Keyboard Maestro automations you use to speed up your workflows. Obviously we want automation because we want tasks done for us. But I think in the world of technology, we also really want things automated because we spend so much of our day pushing buttons, turning knobs, clicking things on and off, tapping on icons, typing data, and even sending voice dictations to get answers to questions or to trigger an action. We probably trigger (a wild guess) 300 or more actions a day. That’s why we’re willing to a pay for technology if it can reduce one less click, one less tap, or one less step in the process. For example, some of us—unfortunately not me—are lucky to have cars that automatically unlock when we stand near the door knob. This simple piece of automation means we don’t have to click yet another button to make something happen. Even in my car, it’s great to turn on the ignition, and less than a minute my bluetooth connected iPhone automatically starts playing the last track or podcast I was listening to. That’s one less tap, one less thing I have to do. Similarly my Apple Watch now unlocks the new MacBook Air I purchased, which means I don’t have to type in yet another password, (which Apple now requires if you’re using Apple Pay.) This is what I call, trigger-less automation, which is also the focus of this article. 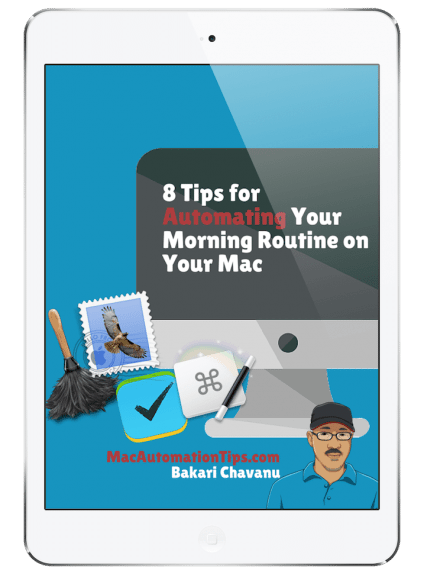 When it comes to Mac automation, I view all the programs I write about for this site to be a form of automation in that each program reduces a step in the process of completing a task. 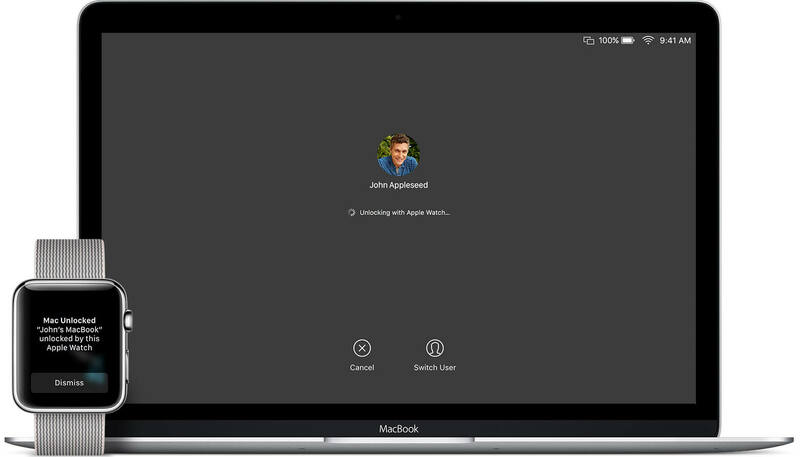 The macOS includes automated features like starting and sleeping your Mac at a specified time. The OS system will automatically switch to another Wi-Fi network when you change locations. Text expansion programs like TextExpander, can paste specified snippets of text when assigned abbreviations are typed. BetterTouchTool, Keyboard Maestro, and Hazel can trigger one or more menu items and move saves clicking or punching keyboard shortcuts. Mac automation tools can trigger a series of actions constitute a workflow that we otherwise would have to do manually. But for me there two broad categories of automation, there’s automation that requires a manual trigger, and there’s true automation that doesn’t need a manual trigger after it’s set up. One of the main reasons I’m hesitant about purchasing an Amazon Echo or Google Assistant is the required voice trigger, and it sadly it seems to require it each time I want to issue a command. With all the clicking, tapping, and button pushing I do throughout the day, I don’t want to use my precious moments saying, “Alexa,” and I especially don’t want to say the two required words, “Ok Google” several times a day. The best automation for me doesn’t require a trigger. Instead of issuing a command I prefer things to happen on their on. I understand how difficult it would be for Alexa or Hello Google to know what I’m thinking and automatically perform search and provide me information. But it when it comes to Mac automation programs, there some truly automated tasks that can be performed without a required trigger. Out of all the programs I write about, Keyboard Maestro has the best features for trigger-less automations. 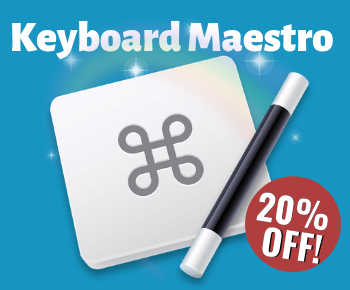 Keyboard Maestro contains over two dozens ways to trigger actions. Most of the triggers are manual, such as punching a hot key, typing a string trigger, clicking an open application, plugging or unplugging an external hard drive or other device. 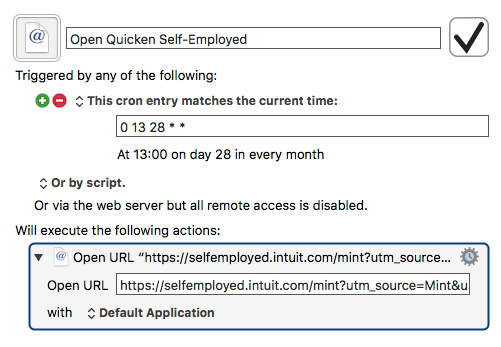 Cron Trigger: set a specific time and date to fire off a set of actions. Idle Trigger: when your Mac has been idle for a while, it triggers an action. Periodic Trigger: a trigger continuously runs based on a specified time and days. Sleep Trigger: A trigger that fires right before the computer is set to sleep. Wake Trigger: Trigger fires when the computer wakes. Wireless Network Trigger: Trigger fires when the wireless network changes to a specified network. I mostly use the day and time trigger for my daily workflows. When KM launches a set of morning pages and applications for me on specified days and time, it means several less clicks that I need to make in order to get started in the morning. Among my timed launches is my task manager, now Informant, which allows me review my tasks for today. Now in order for the KM time trigger to work, the computer must be on and awake. So I’ve set my computer to automatically wake at 8:30, and then a few minutes later KM fires off the time trigger I set up. I actually keep a folder of time launches in Keyboard Maestro that mainly consists of launches web pages I want opened throughout the week, including Raley’s grocery store page to check the week’s special and my YouNeedABudget account, so that I can review my bank transactions and approve their category assignments. The new cron trigger feature in KM allows me to set a specific day and time each month to have a webpage open, which again saves clicking. The cron triggers are a little tricky to set up, but it’s worth the effort to learn how to use them, especially if you work at your computer on a daily basis. Here are a few examples. 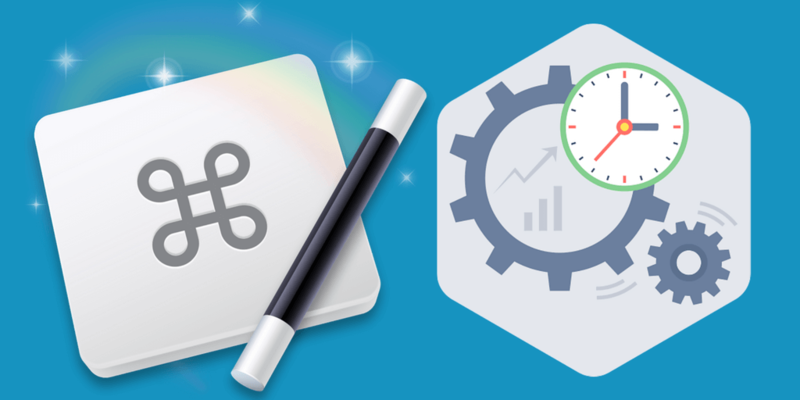 With these trigger-less timers and launches, my time macros essentially act as a task manager, replacing the need to add those tasks to my Informant manager, which means again a few less clicks and typing. If you’re a Keyboard Maestro user, share your trigger-less macros and actions in the comment section below. We can help one another get more out the features if we share our case uses with one another. Just now using a time trigger in quest to automate email filling. Using KM to export Apple Mail to Finder folder then having Hazel sort “the regulars” (mostly bills) from that folder to their respective folders. I’ll be updating the Hazel rules for awhile but after I’ve incorporated the regulars, it will be a nice ongoing savings. Hey Bern, thanks for sharing that. Hazel is definitely another trigger-less automation tool. I don’t have it installed yet on my new MacBook Air (long story about why I didn’t migrate my entire system from my old MBA), and not having it means I’m not getting some files managed in my Downloads folder. As for mail, I use a smart rule for copying designated receipt emails to a mailbox folder, but if the rule doesn’t match a receipt email, I’ll have to drag it to the folder. Whilst I don’t see many reasons to use a voice assistant to interact with your mac when you are sitting in front of it with a mouse and keyboard. I do use it a little when interacting with my mac mini in the living room. Have you taken the plunge into home automation? One interesting aspect that may extend triggerless automation is via sensors for temperature, presence(iphone present/absent), etc. The simple act of leaving your house could trigger a whole range of actions including IFTTT actions. Hey Scott, thanks for your feedback. The only home automation I’m using right now are three Wemo time chargers that turn devices on and off at specified times. I’ve used an IFTTT action in the past with Wemo, but I need to review what the possibilities are. The temperature/presence automation is a very good idea.